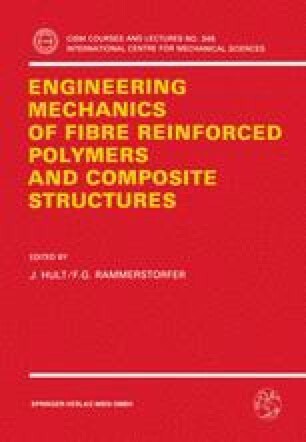 In this Chapter a Mori—Tanaka-type micromechanical method for modeling the thermoelastic behavior of composites with aligned reinforcements is described in some detail. The basic assumptions underlying mean field approaches are discussed, and a number of general relations between the elastic tensors, the concentration tensors and the mean fields are given. Eshelby’s solution and the equivalent inclusion method are used for obtaining expressions applicable to dilute composites. After introducing the concept of the average matrix stresses, Mori—Tanaka expressions for the concentration tensors for composites with non-dilute inclusion volume fractions are derived, from which the thermoelastic properties can be directly obtained. Finally, limitations as well as some extensions of the Mori—Tanaka approach are discussed.